Summary: If mathematics is the language of science, then fluency should be the goal, which means the traditional “layer cake” approach to 3 years of high school math (Algebra 1, Geometry, Algebra 2) is probably not the best approach. The shapers of Common Core’s math standards realized this, and now states that adopt their standards can choose between two high school “pathways”, either the layer cake or integrated approach, where students learn algebra and geometry together. John Saxon* actually pioneered the integrated approach in the United States back in the 1980’s, but his integrated approach was only one small part of his textbooks’ successes. His method of “incremental development with continual review,” combined with a constant encouragement for students to learn by doing, were the keys. 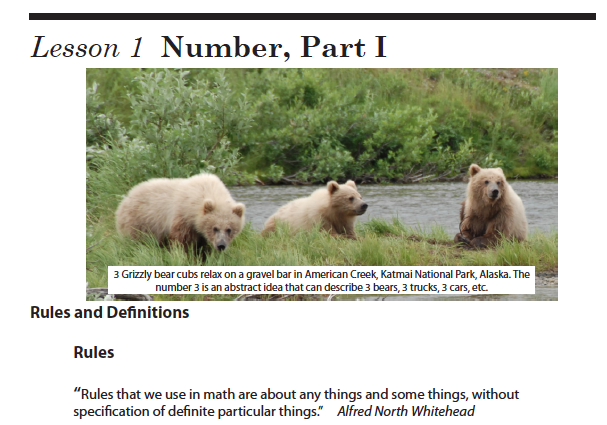 Shormann Math builds on John Saxon’s efforts to really teach math like the language of science that it is, by not just connecting students to their world, but, more importantly, to their Creator. In doing so, students learn to wisely mingle concepts like science and Scripture, faith and reason. Doing so makes it easier to learn subjects like calculus, which really does require a faith commitment in order to make sense of it. Because of its obvious connections to God’s attributes, secular calculus courses steer clear of this, and in so doing make it much more difficult to learn. Shormann Math will change that. *John Saxon passed away in 1996, and the company he founded, Saxon Publishers, is now owned by Houghton-Mifflin/Harcourt. They have since created some Saxon-in-name-only Algebra 1, 2, and Geometry textbooks. Click here to read our review of the new books and to learn why we don’t recommend them. 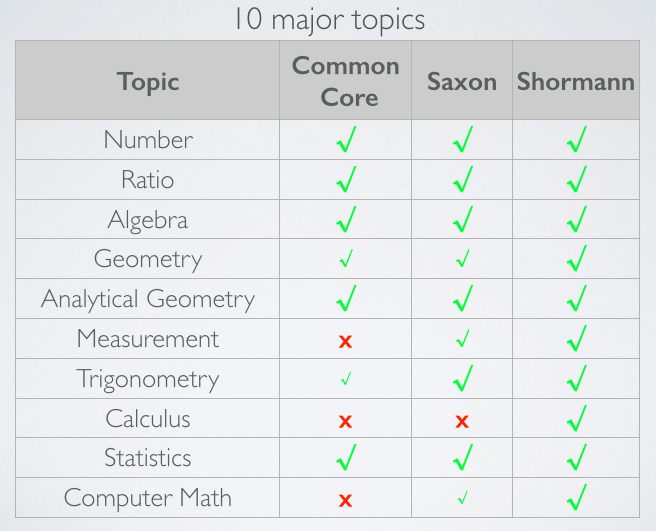 The 10 major topics of Shormann Math, compared to John Saxon’s books and Common Core standards. Measurement is a topic that is a natural part of any math course seeking to teach math as the language of science. That it’s missing from three years of Common Core high school math is a huge problem. As a science class and lab teaching assistant during graduate school, one of the biggest math-related struggles I remember was students’ inability to convert from one unit to another. And it’s not just Common Core, most government school standards are weak in teaching measurement-related topics. All Shormann Math high school courses will keep students fresh with working with measurements. Computers are also a very real part of every students’ world, so knowing about some of the mathematics behind them should be a priority. And, as mentioned in the Summary above, calculus becomes a normal part of high school math when one of the priorities is to connect students to their Creator. As Euclid famously said centuries ago, there is no royal road to learning. However, some methods are definitely better than others, and the Common Core’s integrated pathway (click here to read an Education Week review) is definitely a step in the right direction. However, the integrated approach has it’s own challenges. To really teach math like the active, hands-on language of science that it is, you have to teach it like languages are taught, or sports, or instruments, etc. You teach students a little bit about something, give them time to practice it, and then build on it. John Saxon called this “incremental development with continual review,” which is missing from Common Core. Also missing from Common Core is the importance of math history. Understanding why they are learning the different math topics makes math more relevant to students. Learning some things about the people behind the math concepts they are learning, as well as some of the great, and not-so-great things they did, makes math more meaningful. And the connection to history also shines a bright light on the rich Christian heritage of mathematics, especially regarding algebra and calculus. Showing students how God’s attributes are clearly revealed in mathematics can make a huge difference in their comprehension and success in the course. Shormann Math’s emphasis on math history means that, in developing the course, I dove deep into the classic works of Euclid, Newton, Euler, etc. Rather than reinventing the wheel, this study of the classics allowed me to develop a curriculum that stands on the shoulders of giants (a phrase often attributed to Isaac Newton). It should be a huge confidence-booster to parent and student alike to know your course is built on time-tested and proven methods for learning math. 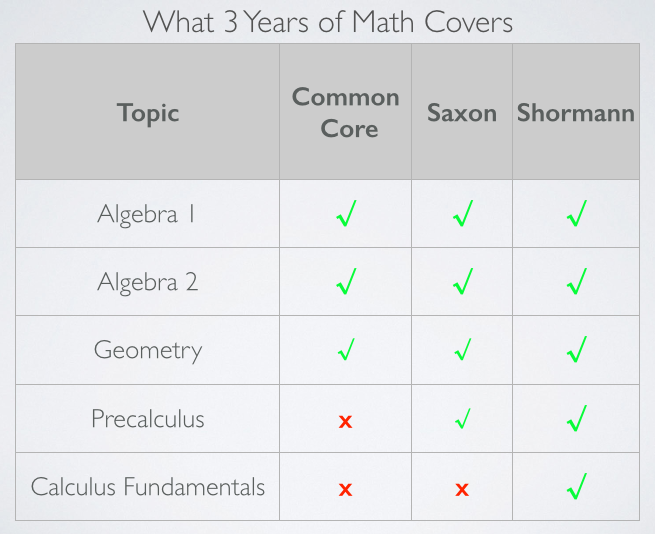 By focusing on what matters most, Shormann Math does more in 3 years than either Common Core or Saxon. In the first two years, Shormann Math covers all the concepts presented on the SAT (the new 2016 version), the ACT, and both the CLEP College Algebra and CLEP College Math exam. A full credit of geometry is integrated into the first two years as well. This is different from John Saxon-authored texts, which include the geometry credit in years 2 and 3 (Algebra 2 and the first 1/3 of Advanced Math). And before you think Shormann Math couldn’t possibly have enough geometry, consider that we will cover all the standards, like perimeter/area/volume, similarity and congruence, circle and triangle theorems, and proofs. In addition, we will show students how the proof technique is not some isolated subject you only learn in geometry class, which is what most students, and parents, think it is. We’ll introduce students to proofs by studying the master, Euclid, covering several of his propositions. We’ll do the standard triangle proofs and circle proofs, but will also apply proof technique in other topics like algebra. And students will learn how proof is used in the real world. They’ll even learn how geometry is used in art and architecture. And on top of all that, we’ll introduce non-Euclidean geometry in Algebra 2, diving deeper in Precalculus. We’ll also use CAD programs like Geometer’s Sketchpad to complete proofs and more. Finally, Shormann Math will introduce calculus fundamentals. By year 3 (precalculus), Shormann Math students will be very comfortable finding limits, and will have a solid grasp of derivatives and integrals. We hope all students will continue on to Shormann Calculus, but if not, they will be more than ready for college-level calculus. Of all the courses in college, calculus is the subject that opens the door to virtually every college major, or if the student cannot pass the class, closes the door on about 80% of majors. The first three years of Shormann Math will give students the confidence they need to take college calculus, and be at a level to help their peers learn it, which can also open up opportunities to build relationships and share the gospel. And completing 4 years of Shormann Math will allow students to possibly prepare for and pass either the CLEP or AP Calculus exam, receiving college credit for their efforts. But Saxon + DIVE Lectures do a lot of this already. Why make a new curriculum? 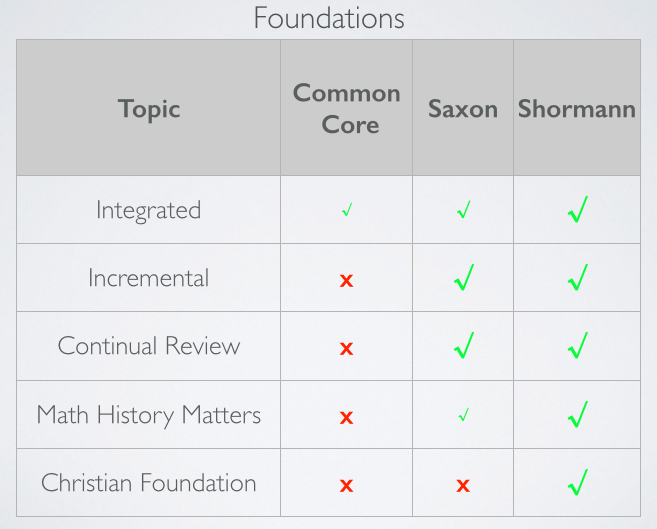 We can build the curriculum on a Christian and historical foundation, rather than bringing these fundamentals in from the side, like we do with the DIVE Lectures that teach Saxon Math. The one topic John Saxon didn’t integrate was calculus. We think it just might be the most important topic to integrate, and our current Shormann Math students are proving Algebra 1-level students can learn some calculus fundamentals! We don’t know how long Houghton Mifflin/Harcourt will continue to sell John Saxon-authored textbooks. We can take advantage of 21st Century technology and e-learning to provide more efficient and effective learning. Our self-paced e-learning format includes many powerful learning tools, including video lectures and video solutions to homework, all for about the same price as the Saxon home study kits. 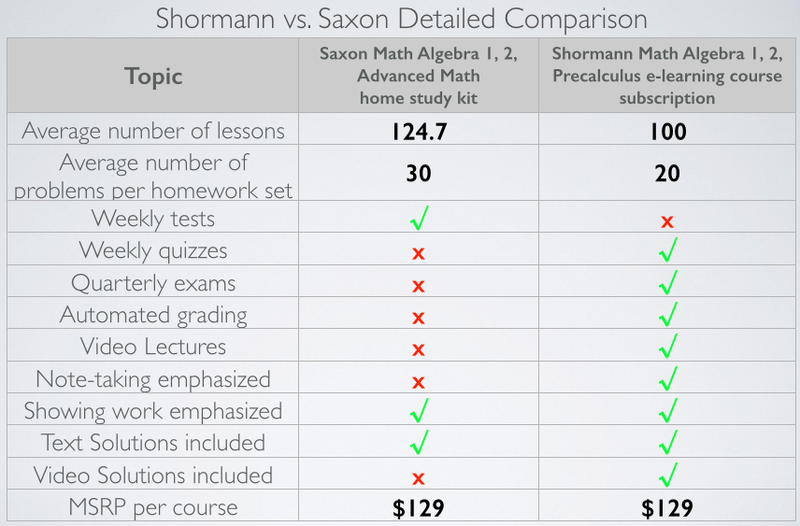 The following table lists some detailed differences between Shormann Math and Saxon Math. What is the prerequisite for Shormann Math Algebra 1? Students who have successfully completed a standard pre-algebra course, including either Saxon 8/7 or Saxon Algebra Half, are ready for Shormann Math Algebra 1. Do you have any questions? Feel free to leave a comment! Click here for a detailed description of Shormann Math, including sample video lectures and pricing information. I never cease to be amazed by the technology of today’s digital cameras. By pushing a few buttons, anyone crazy enough to bob around in a 6-8′ high shore break can capture some amazing beauty in God’s creation! But as the photos above reveal, the beauty only lasts for an instant. It seems impossible that things can change from beauty to chaos, or vice-versa, in so short a time. 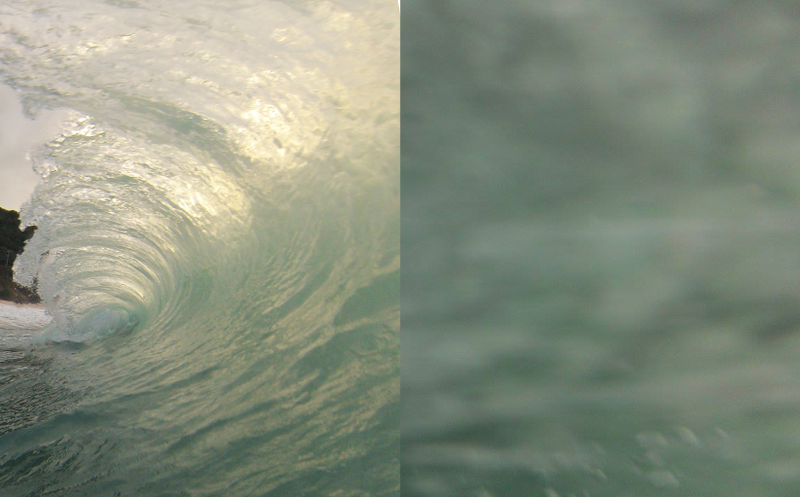 But big changes can and do occur in even less time than the tenth of a second that elapsed between these two photos. Strangely enough, instantaneous change, something us humans really can’t fully comprehend, is behind almost every major technological achievement of the past 300+ years! How can that be? How can something we will never fully understand help us make all sorts of useful devices? Well, some things we just have to take on faith. Faith is at the heart of the branch of mathematics known as calculus. And calculus is all about the study of instantaneous change. Euler understood God’s relationship with man and creation very well. He also understood mathematics really well, too! Much of the way we teach mathematics today comes from Euler’s textbooks on the subject. In our new Shormann Mathematics curriculum, we believe that all 10 major topics covered, including and especially calculus, are best understood by connecting the study of mathematics to Jesus Christ, the founder of all knowledge, and the founder and perfecter of our faith (Hebrews 12:2).